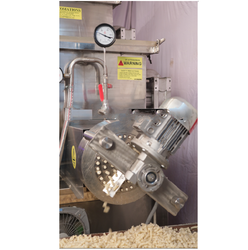 Providing you the best range of pasta making machine and macaroni making machine with effective & timely delivery. One of the Largest Manufacture of PASTA / MACARONI Making Machines in all over PAN INDIA .We are counted in one of India’s fastest growing industries specialty in Food Processing Machines. Nearly 770 completed installation projects a year – in 15 States in all over INDIA . K.P Automations is a medium-sized, owner-managed company So, even now we maintain close relationships with our customers. 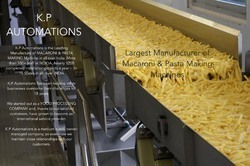 K.P Automations is the leading Manufacture of MACARONI & PASTA MAKING Machine in all over India. More than 100+ staff at NOIDA. Nearly 1200 completed installation projects a year - in 15 States in all over INDIA and counting - are testament to this. K.P Automations has been helping other businesses overcome their challenges for 18 years. We started out as a FOOD PROCESSING COMPANY and, thanks to our satisfied customers, have grown to become an international service provider. K.P Automations is a medium-sized, owner-managed company, so even now we maintain close relationships with our customers.